I once met a delicate Spring, of grandmotherly age, yet retaining a youthful quality as Springs often do. She appeared at her first session of the classes I taught (back in the 80’s!) wearing powder blue, looking soft, feminine and dainty, entirely in tune with her personality even though powder blue was not her perfect color. After receiving her Spring colors, she returned to class the following week in a wild Indian print dress sporting every bright color in the Spring palette! She had clearly misinterpreted her colors. 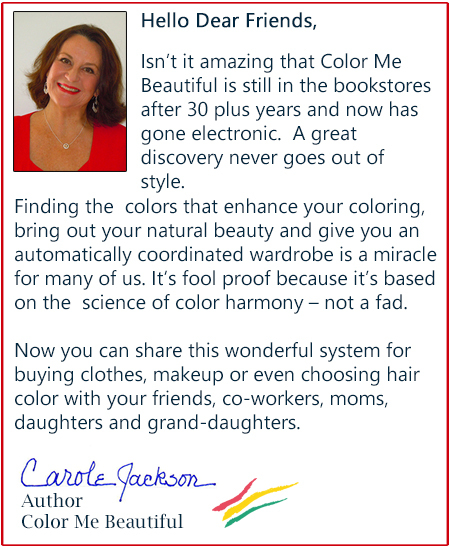 Your colors work best when you use them to harmonize with your coloring, your body type, and your personality. Our Spring, for example, with her flaxen hair, pale blue eyes, and ivory complexion, had a soft appearance. To achieve her best look, she needed to build her wardrobe around her delicate to medium colors, using only the merest touches of bright as accents. The geometric Indian print was out of character for her. Whether YOU are a Spring, Summer, Autumn or Winter, you must choose the colors and combinations that suit you as an individual. 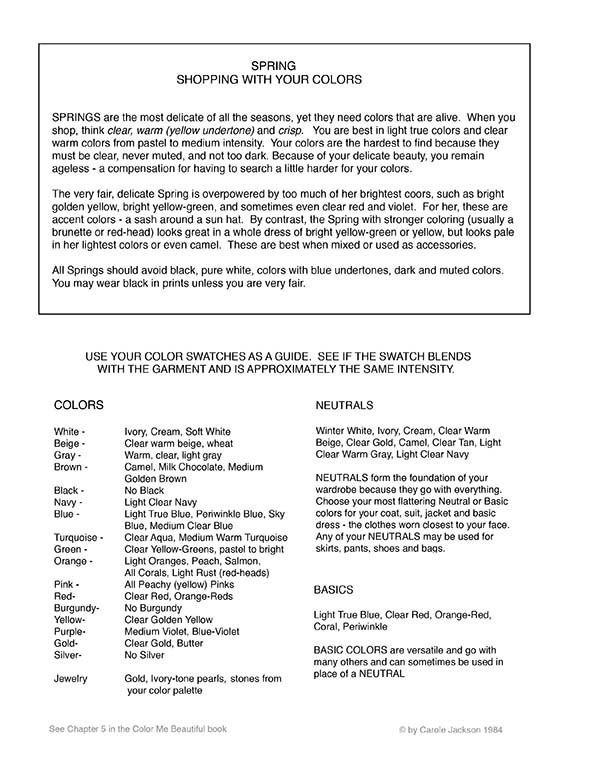 Each season has light, medium, and bright colors which are all valuable, depending on how you use them. One Summer may look ethereal in pastels while a “bright Summer” glows in the perkier colors of the Summer palette and a sophisticated Summer looks gorgeous in the darker, more dramatic shades. 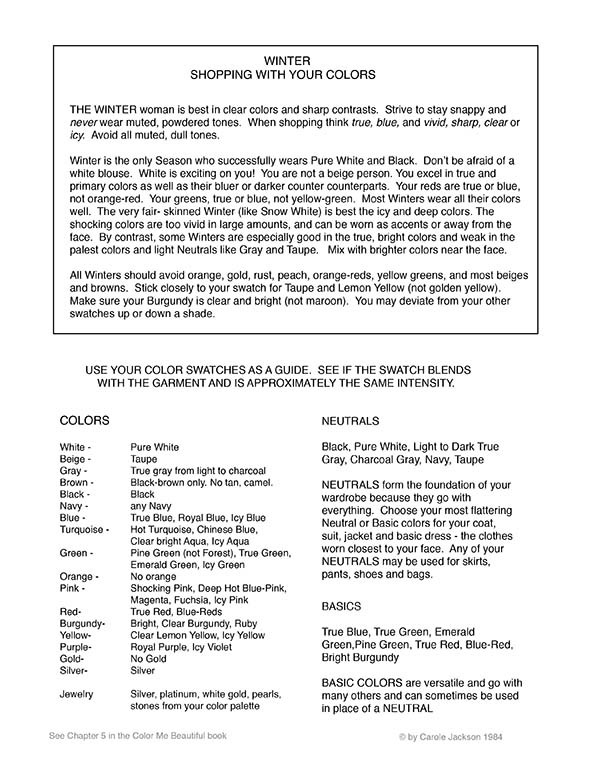 Bear in mind, too, that the coloring of people within each season VARIES in intensity. 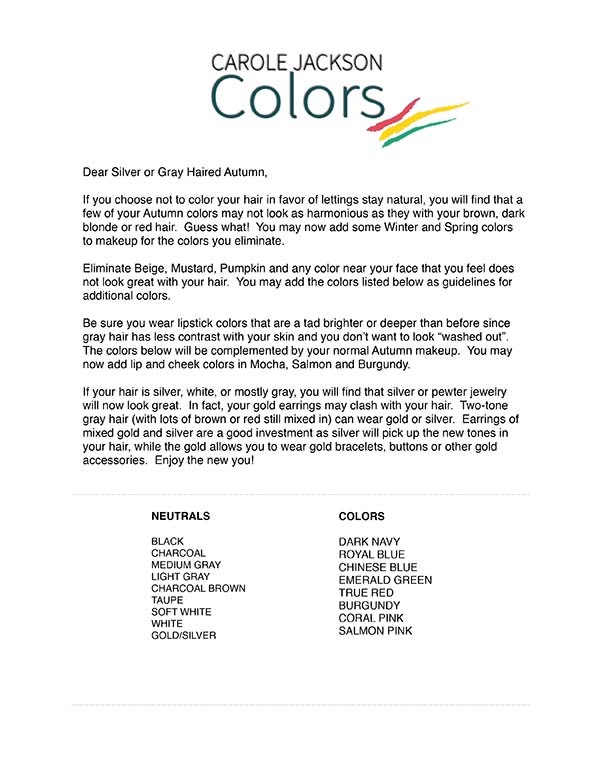 Most people wear all their colors well, but some, depending on their hair color or the depth of their skin tone, wear some colors best near the face, saving others for accessories or clothing farther from the face. When you shop for clothing, wear your complementary makeup for your Season, and best if your hair looks nice. You will get a much better impression of how the outfit looks on you. When I’m in my grungies, with 4-day old hair, trying on a cocktail dress, it just doesn’t do the trick. Every woman can find a color or two from each palette that looks good on her. 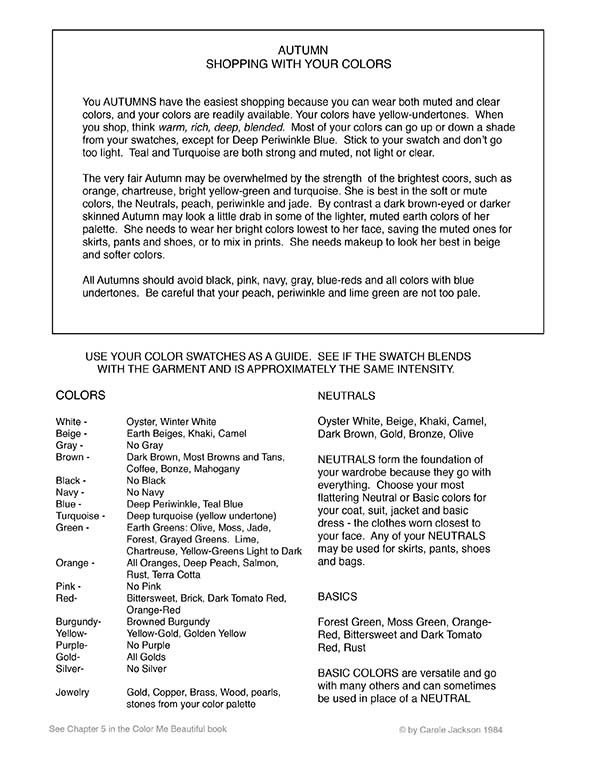 But there are TWO benefits to SHOPPING ONLY FROM YOUR SEASON’S PALETTE! 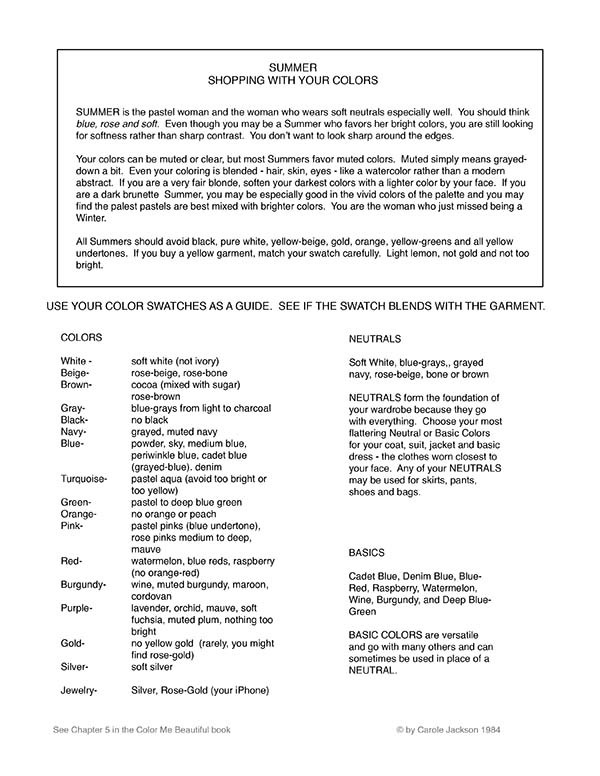 ONE: YOU WILL LOOK TERRIFIC WHETHER IN YOUR TEE OR A BALLGOWN! TWO: YOU WILL HAVE AN AUTOMATICALLY COORDINATED WARDROBE!!! !